The piano is a musical instrument played by means of a keyboard. It is one of the most popular instruments in the world. Widely used in classical music for solo performances, ensemble use, chamber music and accompaniment, the piano is also very popular as an aid to composing and rehearsal. Although not portable and often expensive, the piano’s versatility and ubiquity have made it one of the world’s most familiar musical instruments. Pressing a key on the piano’s keyboard causes a felt-covered hammer to strike steel strings. The hammers rebound, allowing the strings to continue vibrating at their resonant frequency. These vibrations are transmitted through a bridge to a sounding board that more efficiently couples the acoustic energy to the air. The sound would otherwise be no louder than that directly produced by the strings. When the key is released, a damper stops the string’s vibration. In the Hornbostel-Sachs system of instrument classification, pianos are considered chordophones. The word piano is a shortened form of pianoforte, the Italian word for the instrument (which in turn derives from the previous terms “gravicembalo col piano e forte” and fortepiano). 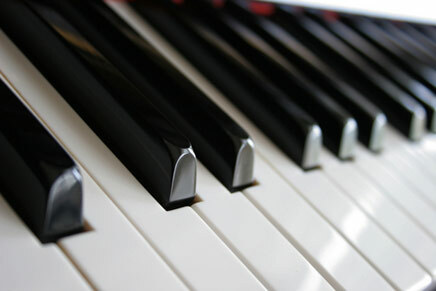 The musical terms “piano” and “forte” mean “quiet” and “loud,” and in this context refers to the variations in volume of sound the instrument produces in response to a pianist’s touch on the keys: the greater a key press’s velocity, the greater the force of the hammer hitting the string(s), and the louder the note produced. To find out more about my tuition services please give me a call on 01473 717290 or drop me an email at info@joannerolphmusic.co.uk.